You are here: Home / The Bee Line / Now, This Is a Swarm! Now, This Is a Swarm! When you hear the term “swarm,” what do you think of? A crazed ant mound in the summer time? The Dark Lord’s host emptying out of Mordor? A colony of honey bees that has decided to reproduce? Since we’re beekeepers, we’ll (briefly) explore honeybee swarms — focusing here on what happens when you are confronted with a swarming cloud of bees, and not with how to keep the bees from swarming. When the first swarm takes off from a hive, it is called the prime swarm. It consists of the queen and 30-70% of the bees in the colony at the time of exodus. Most of the bees tend to be younger house bees, ready to set-up a new home and tend the eggs the queen will lay in their new abode. Under the wrong condition, a hive can practically swarm itself to death: secondary, tertiary (and so on) swarms can happen, headed by virgin queens and again roughly half the bees that are in the hive. These afterswarms are smaller and of less value to a swarm catcher. Many times the best use as far as beekeeper is concerned is to boost an existing colony’s population by doing a newspaper combine. The number of bees is radically reduced in each afterswarm, as are the bees left in the hive. In the end there may not be enough bees left in the hive to rebuild their population, causing the hive to dwindle and die. When a swarm commences, bees pour out of a hive and fill the air with sound and motion. The cloud of bees moves to a way point where a cluster forms and from which scouts go out to identify the best new home for the bees. Once a new home is identified and agreed upon, the bees again take to the air making a dramatic entrance at their new home. It is at the way point where swarms are most often captured by beekeepers. A beekeeper who has a single hive can tell fairly easily if his/her bees have swarmed — a reduced population of adult bees, a lack of eggs and young larvae, and the presence of queen cells — all should have the beekeeper thinking that the hive probably swarmed. Beekeepers with multiple hives will have to look a bit harder. Was it the hive you were crowding to make comb honey? Was it the hive on which you placed multiple supers of foundation in anticipation of a nice honey crop? Detective work is called for. A beekeeper who finds a hive queenless after a swarm should NOT panic. Most of the time, there is a new queen who has hatched already or will soon do so, complete a mating flight, and start laying. The new queen once hatched will supposedly go around to the other queen cells and kill the developing queens before they can emerge, though if there are many queen cells (I’ve seen as many as 17 in one hive), they often do a less than perfect job, the result of which is afterswarms. When I first started keeping bees, I would spend hours watching my hives. Much can be learned from observing — the bees display a variety of activities that beekeepers can recognize. Some, like an afternoon orientation flight by young bees, show normal colony development. Others, like a swarm issuing, are largely seasonal and happen at a particular time of day (late morning). Still others, like bearding, can be indications that the colony isn’t entirely satisfied with its provided environment and that perhaps the beekeeper needs to change something. An understanding of what is happening inside the hive is important for interpreting external hive observations. While there should be a purpose for every inspection of the hive, beekeeper education is important and will tell you what to expect in external observations. Seeing a swarm moving about is memorable. Knowing what is happening in the hive that produced the swarm goes a long way toward making you a better beekeeper. 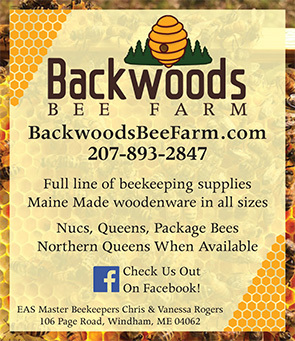 My Swarm – Maine Swarm Hotline to the Rescue Preparing for Swarm Season Swarm Catching: A Fun [Club] Opportunity? Remember That Swarm Trap?